A body has been recovered from the site where two vessels collided in the East China sea, as environmental authorities rush to contain oil leaking from one of the ships. The two vessels — a Panama-registered Iranian oil tanker and a Hong Kong-registered bulk freighter — collided on the evening of January 6 roughly 160 nautical miles (296 kilometers) east of the Yangtze River estuary in Shanghai. China's Ministry of Transport said on Sunday that the Sanchi oil tanker's 32 crew members — 30 Iranians and two Bangladeshis — were missing. The body recovered on Monday was believed to be that of one of the missing crew members. The freighter's 21 crew members, all of whom were Chinese nationals, were rescued. The tanker was en route to South Korea and carrying 136,000 tonnes of condensate oil when it collided, immediately erupting into flames. 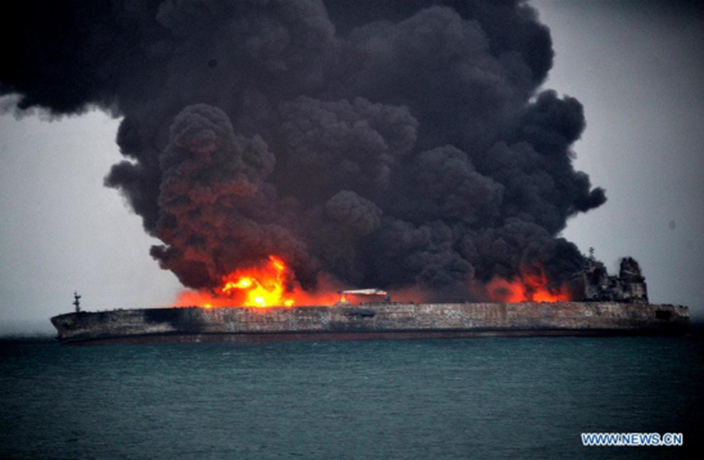 As of Tuesday, the ship was still burning and spilling oil into the nearby waters. On Tuesday, transport ministry authorities also warned that the tanker was "in danger of explosion and sinking, and the toxic gas... is very harmful to rescue workers on the scene." Analysts also warn that if all the 274 meter tanker's oil spills, it could be the biggest oil slick from a ship in decades and may potentially devastate marine life in the area. However, Greenpeace released a statement saying that most of the oil would likely burn off in the flames rather than enter the water. A vessel carrying "protective suits, masks and gas testing equipment" was sent to help put out the flames. Cleaning ships have also been dispatched in order to prevent "secondary disasters." Meanwhile, as many as 13 rescue vessels from China, South Korea and the United States were said to be searching for the remaining 31 missing crew members within a 900 square nautical mile radius of the burning tanker. On Monday, Shanghai's Maritime Safety Administration issued a warning calling for all ships to avoid coming within a 10 nautical mile radius of the accident scene.